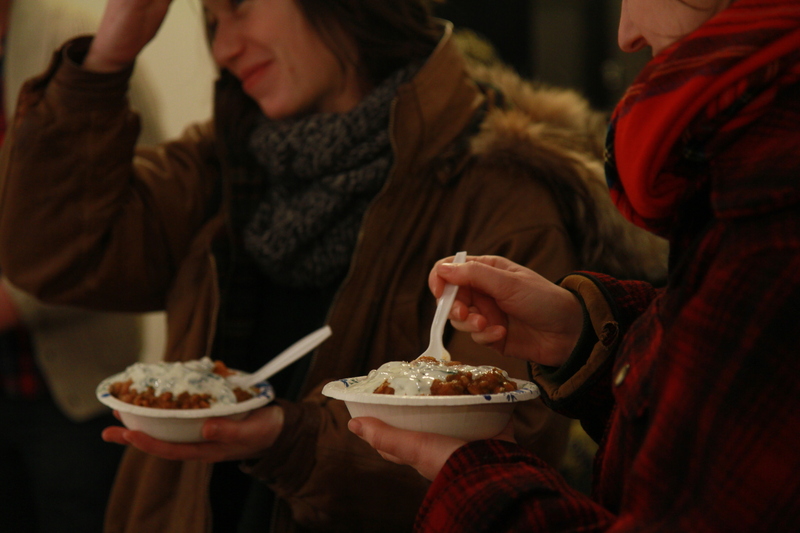 Thank you to everybody who showed support by braving the wintry, cold, messed up L train, Sunday night urge to stay home and attended the first ever public screening of Cooking by Heart at 3rd Ward! I truly couldn’t have been happier with the turnout. It was incredible to see the seats fill up and to feel such sweet love and support. 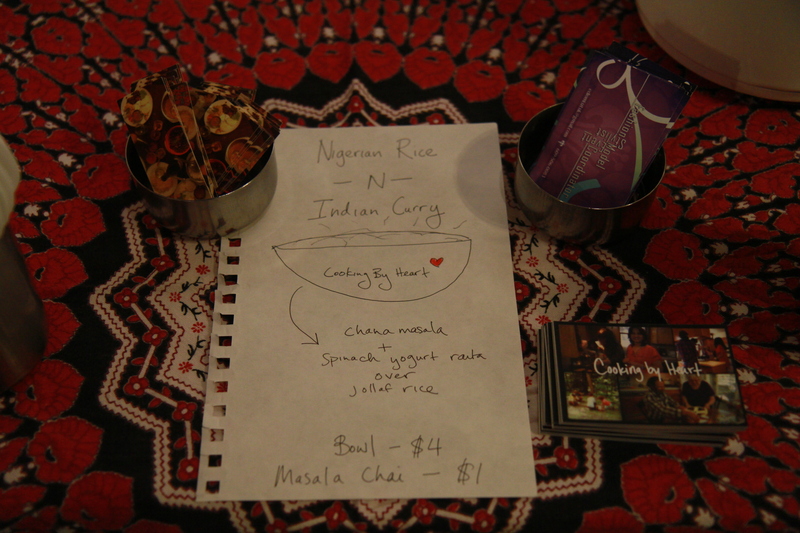 Before the screening began, Chitra Agrawal, of The ABCD’s of Cooking and from Vishwani Agrawal’s Chapati, prepared Chana Masala (Chickpea Curry) and Spinach Yogurt Raita. 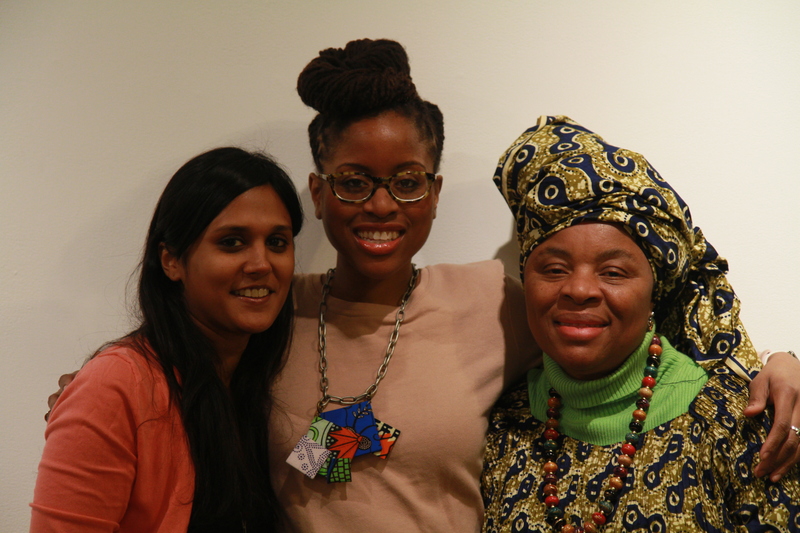 Mother-daughter duo, Affiong and Ediomi Utuk prepared Nigerian Jollof Rice. 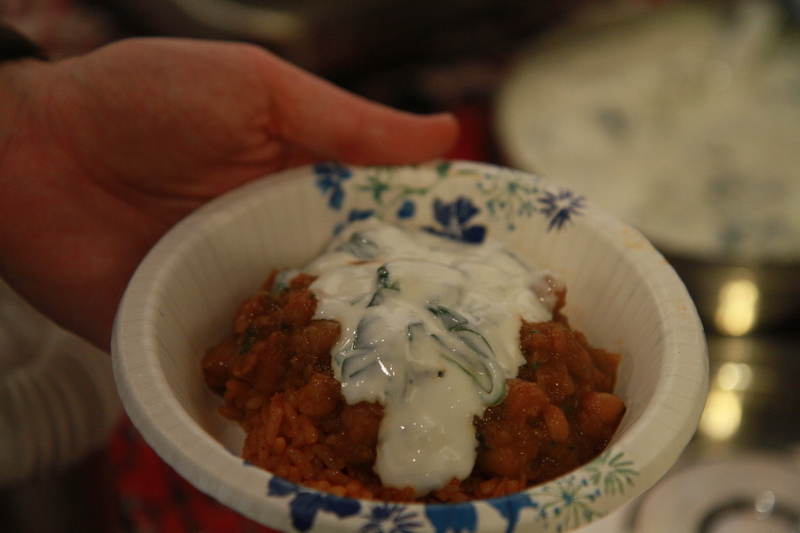 For $4, they served up perfectly spicy and delightful bowls of jollof topped with chana masala and a spoonful of spinach raita. And for an extra $1, homemade chai by Chai Master, Chumma. That chai got me all types of hopped up, which didn’t help calm my nerves! The food went fast and I hope everybody enjoyed the musical performance that opened the event and the three videos we shared. It was the big premiere for Jollof Rice, and it was an honor to share it with Affiong and Ediomi for the first time on a nice big screen. Our three pieces were followed by longer documentary called Everyday is a Holiday, by Theresa Loong. It was a pretty incredible story. In the piece, Theresa learns about her father through a diary where he documented his inner thoughts. His story is gruesome and tortured at times but his sweet, silly and positive attitude in the face of adversity and discrimination is awe-inspiring. Keep an eye out for it on PBS soon! I had such a good time, and I everybody else did too! Thank you Moviehouse, Shantell, Theresa, Chitra, Ediomi, Chumma, 3rd Ward, and everybody who came to support!